Big is always better when it comes to Halloween props. We’ve seen an emphasis on taller props recently. Last year we saw a 6.5′ witch introduced and this year at Spirit Halloween and earlier this year Seasonal Visions rolled out a 7′ Evil Clown for 2017. 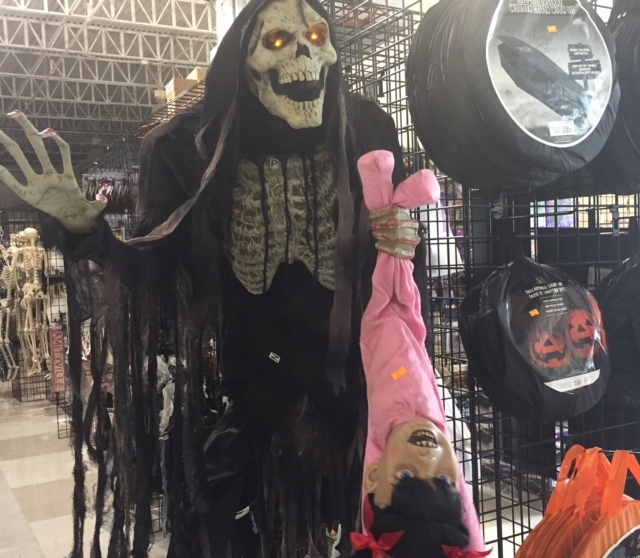 Now Morris Costumes is keeping pace by featuring a Towering Boogeyman prop that will be available for Halloween 2017. 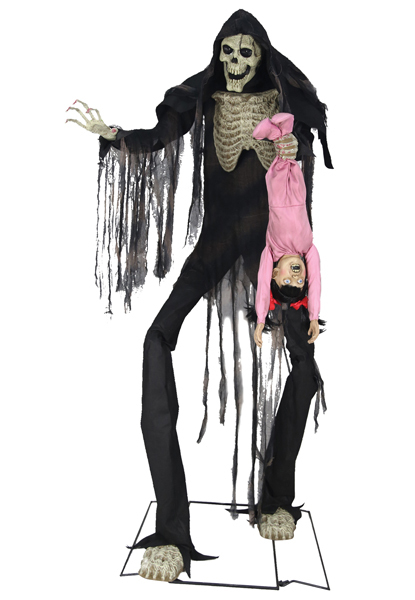 The 7′ skeleton comes with a little girl who screams as the boogeyman swings her back and forth. 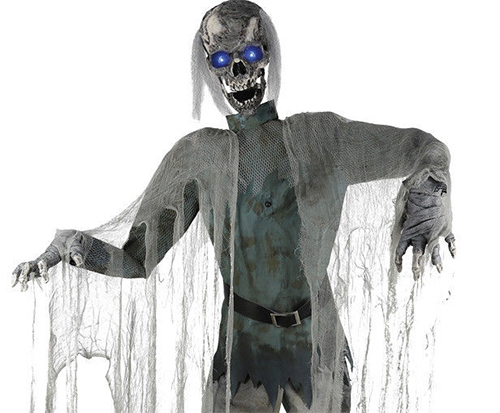 Unlike other new additions to the Morris Costumes catalog the Towering Boogeyman doesn’t talk or have any phrases he repeats when he’s triggered. He simply laughs as the swings from side to side. The Towering Boogeyman is available at Halloween Express for $279.95 plus shipping. He’s not in stock just yet but will likely be ready in a month or two when most new props are in stores. I did find the prop on eBay for $249.99 plus free shipping. The seller admits the prop will not be in ship until sometime in July, August or September and is only available for pre-order only. Like most Morris Costumes props the Towering Boogeyman comes with a Steady-on Infra-red sensor that can be triggered up to 6.5′ feet and also works with a ‘Step Here’ footpad that is standard in the industry. I’m not sure if I will be adding the Boogeyman to my collection. He is really cool and very tall which makes him standout among other props but he does resemble the Cauldron Creeper that came out last year that I already have. If I can find him a little cheaper I will definitely bring him home. 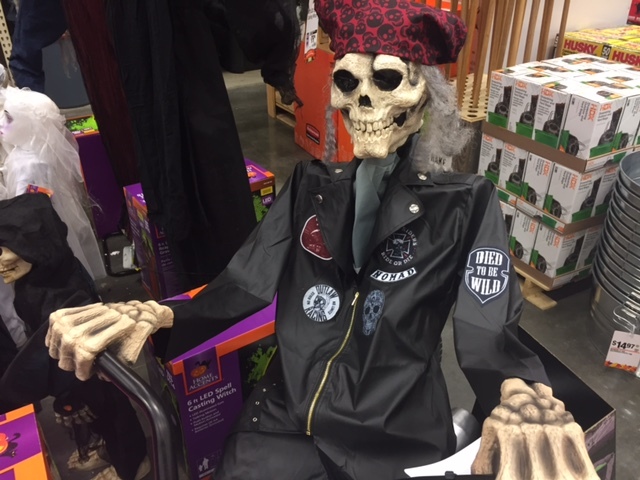 He’s definitely one of the props I will be keeping an eye out for on November 1st when everything is half off in the big box Halloween Express and Spirit stores all over town.